I just wish I knew who the commentator was. 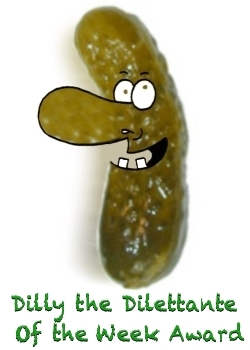 Because if anyone deserves a dilly it’s him. There’s no point in either arguing with or even carrying on a discussion about the Bible with such invincibly ignorant persons. 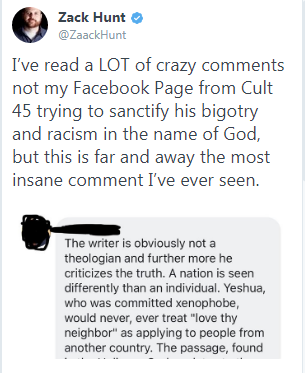 I mention this only to highlight, once more, that there are people who should not be allowed within 500 miles of any Bible because all they know how to do to it is distort it and mangle its meaning for their own political purposes. Such persons are beyond help. Another fake academic pretending to know something about the Bible when he doesn’t even know the basic story. What a buffoon. 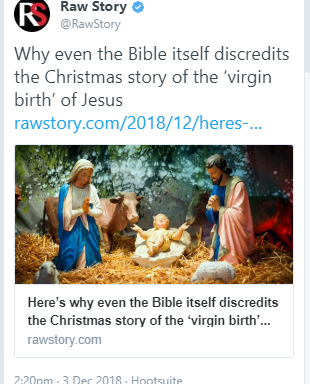 It’s an essay, on the bible, about the ‘virgin birth’, by, now get this, not a biblical scholar, but by a psychologist! Hey, Raw Story, why not get a climate change denier to write an essay about the weather? Or an anti-vaxxer to write a piece on the perils of vaccinations? Are you DAFT? Do you know NO biblical scholars? Hit me up, I can introduce you to a hundred who are more qualified than a psychologist to write an essay on the Bible. God help me, I am SICK TO DEATH of journalists and psychologists and all manner of uninformed imbeciles pretending to know what they’re talking about when they talk about the Bible. Stupid dilettantes. Raw Story- here’s your Dilly. Pass it along to the psychologist. You two can share it this week. She has no idea what the Bible means, what Christianity teaches, or what Christian theology is about. Dilettante. Politicians need to stay in their lane and do their little political silly things and keep their defiled hands off of Scripture. 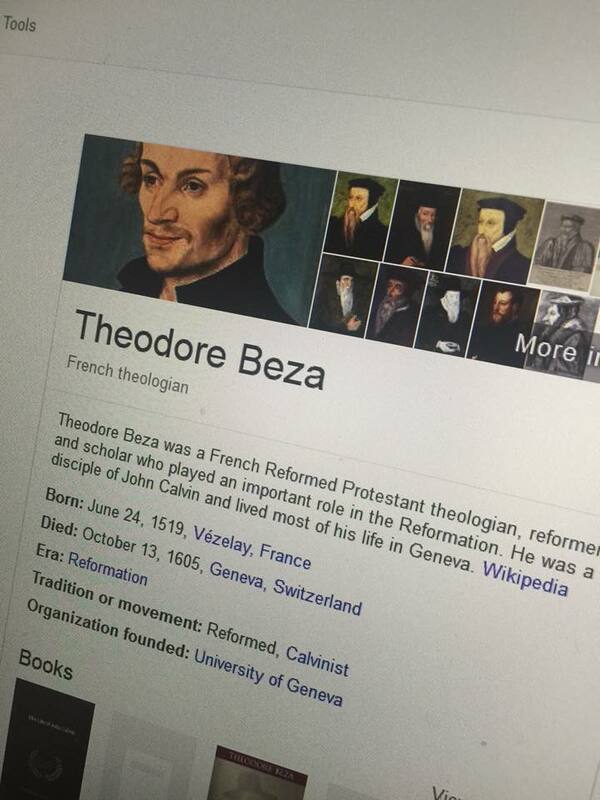 They can’t even tell Melanchthon and Beza apart… dullards. (Photo by a friend. I don’t visit wikipedia because, well, it’s stupid). This is sickening and vile. 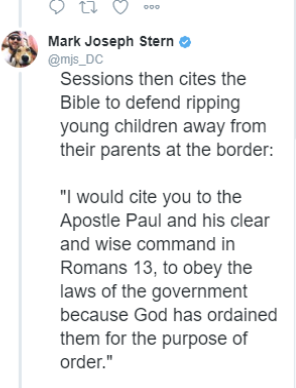 Sessions quoting the Bible out of context is exactly why dilettantes like him, distorters of Scripture, shouldn’t be allowed within 100 miles of the Bible. He should never talk about the Bible again- because he doesn’t understand it at all. Are They Getting People Who Are Capable to Do It, Or Will it be the PE Teacher? Because what’s the point of having an ignoramus or a dilettante teach a course? If passed, Iowa would join a small but growing number of states with “Bible literacy” laws that allow or require public schools to offer such courses. Supporters say that studying the Bible for its historical and cultural influence is instrumental to understanding western civilization and the values on which America was built. 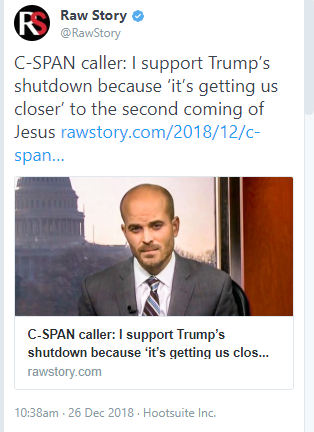 “Beyond its literary and cultural significance, which is significant, the Bible is also an essential thread of the American consciousness, and without it, American unity is unraveling,” said Drew Zahn, spokesman for the Christian conservative organization The Family Leader, which is endorsing the legislation. Yeah, sounds like they’re going to have anyone free during the classtime to do it… Great- more ignorance imparted. 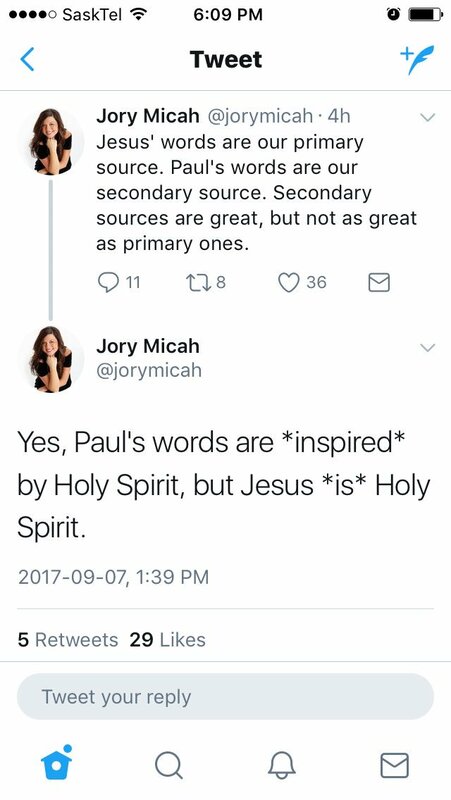 From time to time (oh alright, just about every day) someone (who doesn’t know what they’re talking about) will insist that theology doesn’t matter because the disciples were just simple fishermen and villagers who followed Jesus around and they just loved him so much that they didn’t need any theology to be faithful. What the ‘ignorant fishermen’ mythicists don’s understand, because in their deep silliness they don’t know it, is that the disciples were precisely that. Disciples. And what is a disciple? A learner. A student. Jesus was a rabbi. He’s described as such and as such he had studied with rabbis and been himself a rabbinic student. And what is a rabbinic student? A theologian. 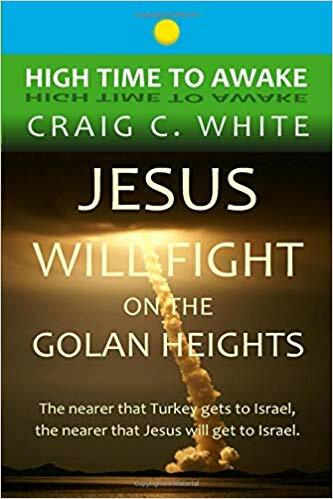 Jesus was a theologian who gathered around himself theological students (rabbis) to whom he taught – what was it – oh yes, theology. Accordingly, Jesus didn’t have ignorant illiterate hicks following him around he had serious students who were expected to do their homework, learn their lessons, and apply those lessons. So at the end of the day the people who think theology doesn’t matter and who love to say that they are just ‘simple followers of Jesus’ have absolutely no idea how Jesus worked. Nor how the disciples worked. Nor how the early church worked. They really, to be fair to them, just have some weird notions they cooked up in their own heads to justify their own theological ignorance. They delude themselves and in their delusions wish to deceive others. They are dilettantes. If they want to be dilettantes, super. 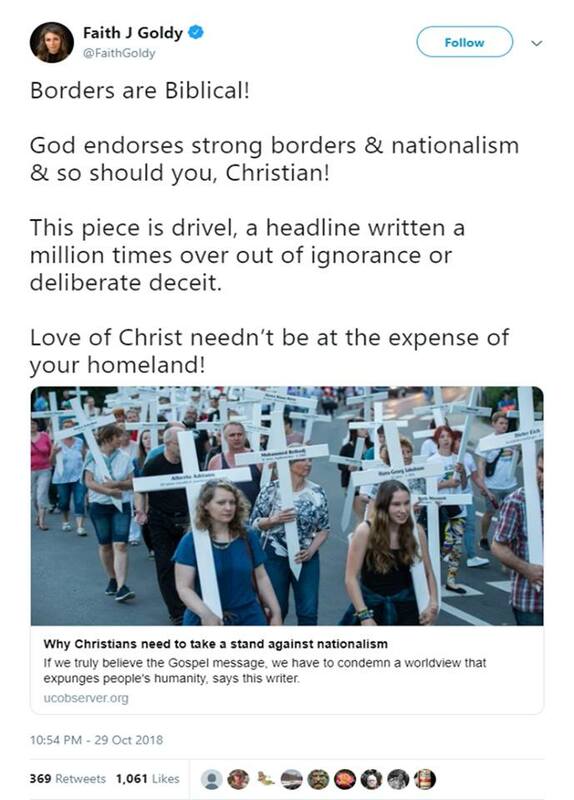 They just shouldn’t pretend that their views of Jesus matter to anyone. I haven’t seen a more ignorant statement on the subject of theology for a good while. So, precious heretical Canadian modalist, here’s your Dilly. It’s well deserved. After a full five minutes of careful study on a controversial topic, local believer Andrea Williams confirmed Wednesday that she had come to the conclusion that the Bible was 100% in agreement with what she wanted to be true in the first place. 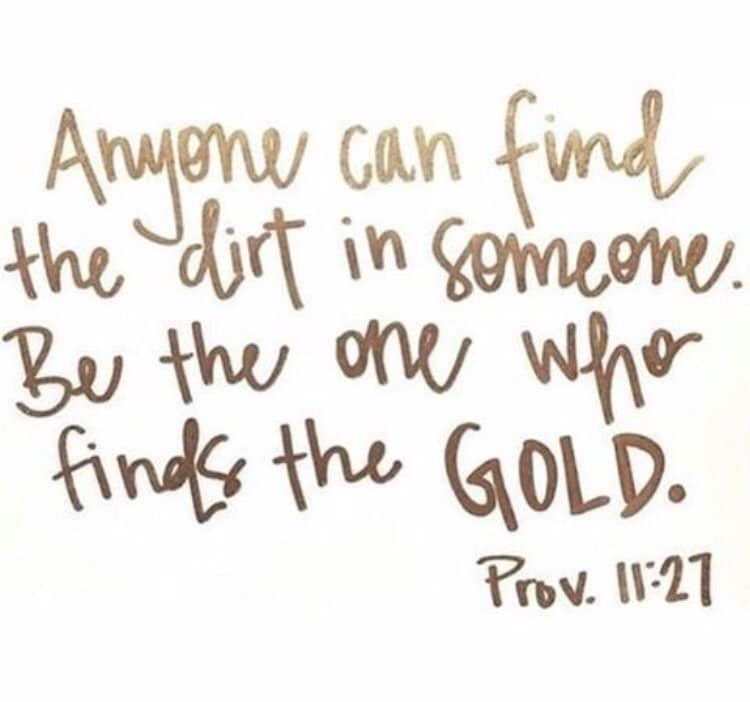 The Christian woman performed extensive research into the topic, including googling phrases like, “how do I explain away verses that disagree with me in the Bible,” and, “how to eisegete,” before cracking open her copy of the Scriptures and spending minutes poring over the text. The self-made scholar was later offered a lucrative book deal on the topic by a major Christian publisher. Unprecedented depictions of the biblical Jonah and the whale have been found at a fifth-century Roman synagogue in Israel’s lower Galilee. In the recently discovered mosaic, Jonah’s legs are shown dangling from the mouth of a large fish, which is being swallowed by a larger fish, which is being consumed by a third, even larger fish. ‘Great fish’. That’s it. Not ‘whale’.